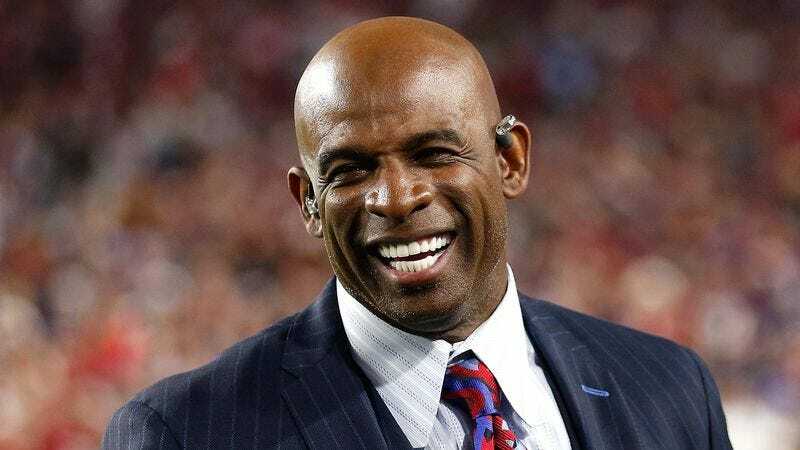 CULVER CITY, CA—Reflecting on how far he has come in his career, football analyst Deion Sanders told reporters Wednesday about his experience starting out at the NFL Network as a researcher. “It wasn’t easy to start at the bottom like that—there were plenty of late nights in the stacks compiling passing stats for every team and combing through player bios for facts to use in the broadcast,” said Sanders, adding that after joining the network in 2006, he worked for nearly two and a half years in an entry-level role before being promoted to segment producer, which eventually led to an audition for an on-air role. “If you screwed something up, or didn’t have the research packets organized and color-coded the way Rich [Eisen] and the other guys liked it, you’d never hear the end of it from the executive producers. I sure didn’t love getting coffee for Brian Billick and Steve Mariucci every morning, or pulling footage from old games to use for pregame highlights, but that’s how I cut my teeth here.” Sanders added that he is incredibly grateful to have gotten the chance to advance at the network and isn’t still stuck working as a production assistant like Curtis Martin.